June started with us leaving Boulder, Colorado where we had been hanging with some friends. We made it to Mt. Evans where we saw a lady moose as we were driving into camp! 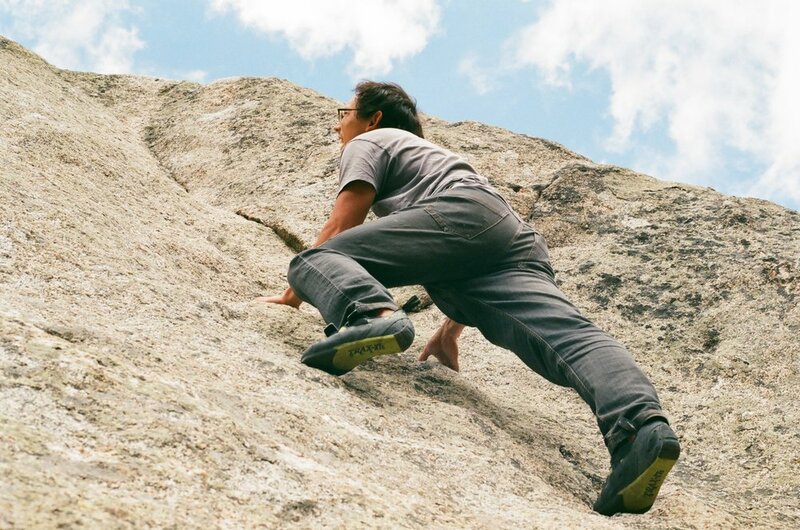 The next day we did some bouldering up on Mt. Evans with Thomas and Justin. It was easily the longest approach we’ve done to get to climbing— I guess we’re just spoiled with short approaches in the Southeast. It was still good climbing, and a great way to spend the day. Our next stop was Carbondale. Our original plan was to do the short hike to Hanging Lake, but unfortunately it was closed for some trail maintenance. With plan A out, we headed farther south towards Marble to check out an old ghost town called Crystal. It was about a 10 mile round trip hike that offered great views of the Crystal River and the surrounding mountains. The hike even took us through an avalanche field that still had snow banks over 15 feet tall! Crystal is famous for its old mill that is right on the river before the town itself. The mill didn’t disappoint! It’s a beautiful old building set right next to a waterfall with mountains as a backdrop. We even got to try out our Tenkara Rod Co fly fishing rod for the first time. The Tenkara style fly fishing rod is unique in that it doesn’t have a reel. It’s like fly fishing with a cane pole, which makes it easy to learn on the fly (see what I did there). We were casting away in minutes, although the trout weren’t interested in the least. Thats ok. We are going in on foot. The following day we left Carbondale with our sights set on Wyoming. We made a stop in Rock Springs to take the van into a shop as it was showing similar smoking symptoms that we thought we’d dealt with last month. The next morning, they ran some tests and it was determined that we needed ANOTHER new engine. Luckily, this time we were under warranty, so the sting was lessened. The engine would take a few days to get shipped to Rock Springs and since the van was still running fine we decided to take off for a few days to explore. After leaving the Wind River Range we had a few more days to kill before our engine arrived to we headed to Flaming Gorge. The Flaming Gorge is a canyon with a river and lake at the bottom. It starts in southern Wyoming and goes down into northern Utah, where there is a dam that becomes Green River on the other side. It was a beautiful area with lots of hills (perfect for testing the new engine) and great views. Down by the dam we decided to do a 14 mile round trip hike along a stretch of the Green River that is know for great fishing. We made it about one mile before the trail was underwater because the River was up so high thanks to snowmelt (nothing was going our way it seemed.) We pushed on for a couple more miles through the frigid water until it got too deep and we turned around. To salvage the day we did manage to find another hike that was high above the water. It traced the high rim of the Gorge bringing amazing views of the sheer cliffs and river below. Sufficiently worn out from our adventures, we made it back to Rock Springs as our engine arrived, ready to be dropped into Stanley. We spent the next 3 days in a hotel knocking out work and spending some quality time on the treadmill. While it sucked to be “stranded”, it was nice to have a shower everyday and have some AC while we worked. We got the van back on a Friday, and immediately pointed ourselves due north. We drove north again past Pinedale to camp for the night. The next day we woke up to drive to a hike south of Jackson Hole. We turned onto the Forest Service road and started going downhill around a blind, sharp bend. Almost immediately I felt the van start to slip as the gravel gave way to mud. I came to a stop at the bottom of the hill and was staring at deep ruts full of water and mud for the next 50 yards. Behind us was deceivingly slippery mud that we would have to go up in reverse. We decided to try and go forward to a spot that looked good to turn around in. I gassed it and went nowhere. We were stuck. In hindsight, I should have never stopped at the bottom of the hill, I should have just kept rolling all the way to the turn around, but there was nothing I could do about it now. After a lot of failed attempts MAK had the great idea to use our levelers to put under the tires for traction. With that method we were finally able to get past that initial spot and make it to the end of the nasty stretch to the spot to turn around. Stopping to catch our breath and ready ourselves for the way back, we had a mini celebration. Once we felt prepared to make it out of there, MAK took the wheel only to find we were stuck in the turn around. We tried the levelers to no avail. After some sitting and being sad, we had the extreme luck to have a gentleman in a 4x4 truck come down the road. He was kind enough to give us a pull out of where we were stuck, and we were able to set ourselves up for the gauntlet that was the way out. The guy in his truck went ahead just in case we got stuck again. His truck, even in 4WD, was sliding around like a greased watermelon which didn’t give us much confidence. I placed some levelers in some particularly suspect spots and MAK hopped in the driver’s seat. She was shaking, she was so nervous. I gave her a quick pep talk, and got out of the way. MAK gunned it to give herself as much momentum as possible through the traction-less mud. The van undulated up and down all the ruts violently as she pressed on. As she approached the spot we had first gotten stuck I held my breath. The wheels of the van started to freely spin, but MAK had maintained enough speed that the van just rolled out of it. SUCCESS! I think that the people in Jackson, many miles away, could have heard MAK screaming with joy as she crested the last hill. The whole saga lasted only three hours, but it felt like a year of tension, anxiety, and fear was taken off our shoulders. Since that hike obviously didn’t work out, we decided to go to some hot springs to relax. We headed up another dirt road (this one was MUCH better) for about 8 miles and arrived with no issues. Excitedly, we power walked up to the pool and paid the high price without thinking twice. We rushed into the pool expecting a hot, soothing soak. Instead we were met with what felt like a barely lukewarm bath. Disappointed doesn’t begin to describe our feelings. We lasted about five minutes and only made it knee deep before we decided that today was not our day and left. The after math of being stuck! There was one more thing that just might make up for all the flops the day had brought: Melvin Brewing Company. Melvin is a brewery located in Alpine, Wyoming. We first tried their beer a little less than a year ago, and have been fans ever since. Melvin came through, and we unwound over a couple of excellent IPAs. The next day we were in Grand Tetons National Park to do some hiking. Once again, snow was an issue, and most of the hikes that went up the mountains were covered. We opted for a hike that stayed low and passed by some nice lakes. The water looked so pretty that I couldn’t resist and had to get in. It was frigid, but worth it. After a nice day, we made our way to camp where we made quite a few new friends. Our group consisted of 2 traveling Brits, Jamie and Tom; Brooke, a girl traveling with her dog, Chalupa; Afred and Emily, a couple traveling around in their van; and Jason, who just finished grad school and is traveling around in his homemade camper with Rio, his dog. We were treated to an amazing sunset, and it was nice to be surrounded by good company. The next few days our group hung out, did some climbing, and got some work done. Alfred, Emily, and Jason set up a booth at the Jackson farmer’s market (Alfred and Emily had shirts, prints, and jewelry. Jason also had jewelry) and we headed down to hang with them and see the market. There were some really cool booths, including one where we got to see sun flares through a telescope. As the week went on our group slowly dwindled as we all went our separate ways, but these are people we will definitely stay friends with. In fact, we left the Jackson area to head into Yellowstone and meet up with Jamie and Tom who had headed there just a day or two before. In Yellowstone the four of us knocked out a few hikes, and did lots of sightseeing. We haven’t been to Yellowstone in 5 years, and I’d almost forgotten just how amazing and unique it is. There are more geysers in Yellowstone than anywhere else in the world! On our last day, after we said goodbye to Jamie and Tom, we did a hike to Fairy Falls and Imperial Geyser. Fairy Falls is a 200-foot waterfall near Grand Prismatic Hot Spring. It’s one of the highest waterfalls in Yellowstone and was surprisingly uncrowded. It’s amazing how many people a hike filters out. After stopping at Fairy Falls we made our way to Imperial Geyser and we were floored. According to Yellowstone’s website it erupts infrequently, but while we were there it was constantly erupting. It was our favorite spot during our time in Yellowstone and we were the only people there! Tough to beat that, especially if you are familiar with the zoo that is Old Faithful. 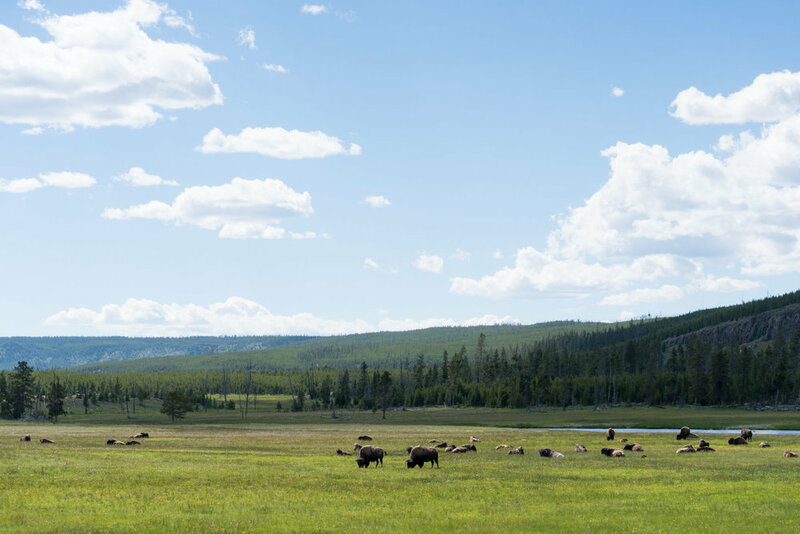 We left Yellowstone feeling refreshed. We were out of service for a majority of our time there, and while it can be inconvenient at times, it’s also pretty wonderful to just focus on each other and friends. Continuing north, we stopped in Bozeman, Montana where our vanlife BFFs, Jorge and Jessica were staying while they did some work. Our other friend, Aidan, also happened to be in town so it was a friendstravaganza. Jorge and Jessica operate very similarly to us in that they work quite a bit while living on the road. So, we spent the week having daily work parties! While in Bozeman, we made it out to a truly hot, hot spring where we got to relax properly. At the spring, Jorge challenged MAK to a swimming race and was handed not one, but two losses. Immediately, the next challenge was made, an old school 50-yard dash between MAK and Jorge. The next day they geared up and it was on. It started out close but as the race went on Jorge opened up a lead that MAK couldn’t come back from. As soon as Jorge crossed the finish line he collapsed in what I thought was the overwhelming euphoria of victory, but later determined to be pulled muscles in BOTH his legs. He truly left it all out there, and we salute him for it. I’m sure there will be a great video to follow as we had many cameras running, plus a drone. On the 29th, we said our goodbyes to our friends and started towards Glacier National Park. We made plans to meet our friends Silas and Sarah there. Silas and Sarah are friends from Atlanta, and this was actually the second time we have met up with them since being on the road (they came out for a climbing/biking trip in November last year.) We met up at the Sprague Creek Campground late that night. Our plan was to wake up super early, do Going-to-the-Sun Road, and try and get a campsite at Many Glacier. The next morning all went according to plan until we got to Many Glacier. There was already a massive line of cars. The longer we waited, the more apparent it became that we would not be able to get a spot. Instead of taking our chances driving to other campgrounds that were over an hour away, we recruited the car in front of us and behind us to be our new friends and got the group site in the campground. Our new campsite mates were two couples: Jay and Kelly, and Max and Alexis. After some introductions and chit chat, we went our separate ways to knock out our planned hikes. Silas, Sarah, MAK, and I hiked up to Cracker Lake, an incredibly turquoise glacial lake. It was the first lake we’d seen like that and it took a minute to fully appreciate just how blue it was. Of course, we had to get in. Turns out, glacial lakes are extremely cold! I could barely stay in for more than a minute but it was certainly exhilarating. We made it back down to camp where we sat around the fire with our new friends and talked over the day’s adventures. It also happened to be my birthday so we celebrated with some surprise, mini cheesecakes. The month started out pretty rocky, but it ended on a great high that we are hoping to carry on into July. Special thanks this month to Jorge and Jessica for hosting us in Bozeman. If you haven’t already, check out their youtube channel. They made a great series of episodes about their adventures last year (plus we make an appearance in some! ).